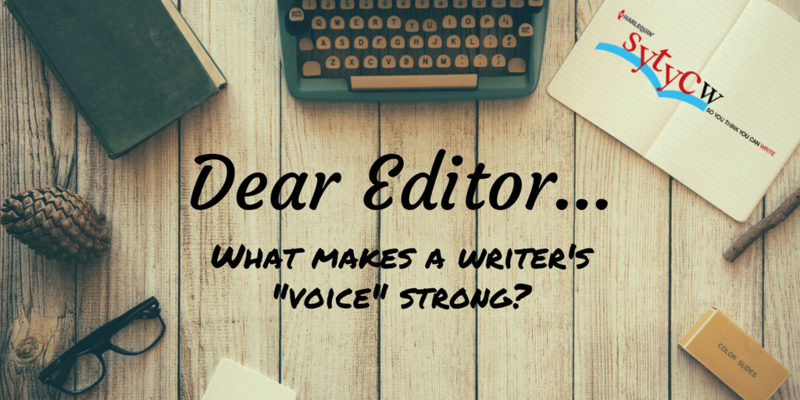 Dear Editor: What makes a writer’s “voice” strong? What makes a writer’s “voice” strong? Editors are always saying that the voice is crucial. Why? A writer’s voice is probably the most important element of the book (aside from the romance, of course). A reader could be underwhelmed by a premise but love the writer’s voice so much that she has to continue reading. The voice showcases the power of the writing. What makes up the voice? Flow of words. Be mindful of how you put words together. Do you have varied sentence structure? Are you careful or strategic with adjectives, complicated clauses, and sentence length? If you read the words out loud, do they create an engaging flow and make sense? Good flow in the narrative takes practice and a lot of editing, but when you get it right, you make a romance reader very happy. Characters. Your hero and heroine are a big part of your voice. They take on lives of their own, don’t they? They compel you to think and write in a certain way. You can’t help but bring them into vibrant focus. The more complex they are, the more they will contribute to the voice of your novel. What’s happening? A good story will roll at breakneck speed if you have a well thought out and interesting plot. Even if every element isn’t original (cowboys, babies, etc…), your voice and your plot will make the story unique. Make sure you have a hook and that you convey that hook as soon as possible, like on page 1. Are you into your own story? 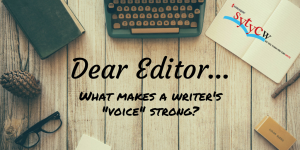 If you’re not into your romance, chances are, the editors will find the voice “weak.” So really, voice starts with how much you love what you’re doing, your enthusiasm. And that’s just a good thing, loving what you do. Essentially, the voice is the power in your writing. You remember the writer’s voice even after the story is over. How many of you were thinking in Bridget Jones-speak when you finished the book? Or maybe you could still see Tara after you finished Gone with the Wind? That is the power of an author’s voice. So how do I boost the voice? Make sure each scene has energy. You might be tempted to slow down and let the pacing lag as you get into the story. It is grueling to write a novel and some sections may not be as fun as others. Here’s a mantra to remember as you’re writing: This lag can’t happen. The voice should be consistent no matter where you are in the book. Edit and rewrite! As with public speaking (ahem), the more you practice and work at it, the better you’ll be. The same is true with writing. A good editing tool is reading your work out loud. Take the time to really scrutinize those problem sections. You might even want to edit backwards, since a writer can run out of steam voice-wise by the end of the book. Trust your instincts. If you’re a little bored with what you’ve written, chances are that your reader will be, too. Don’t let this happen! Go back and stir up trouble with your characters, add complexity to the plot. This will make the writing more fun for you and your voice will thank you for the extra effort. For some, voice comes naturally. The book will “write itself.” We’ve worked with writers who wrote one book and then sold it immediately. For others, it might take some honing and development to get that voice as powerful as it needs to be for the reader. Whatever the case, it’s important to take the time and get it right. Most of all, have fun with it and good luck!